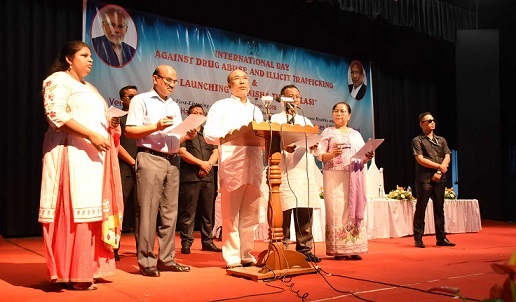 The International Day Against Drug abuse and Illicit Trafficking, 2018 was widely observed in Manipur too on Tuesday. Speaking about the campaign, the chief minister said 80 schools would be identified as ‘Drug Free Campus’ and senior students and teachers would be given training to create counselling centres at the respective schools for drug abuse prevention. Informing that government is drafting a State Drug Policy and which is almost in its final stage. Any suggestions, advices and opinions are very much welcome, he said adding, “Since the day one of the present government, we are working towards curbing the drug menace in the state.” The government has already initiated a state wide campaign on War against Drugs. Highlighting the achievement of the movement in the recent past, he said that around 1853 acres of poppy plantation amounting to Rs. 130 crores were destroyed in the last one year. Altogether 222 cases relating to drugs and other illegal psychotropic substance were registered, 264 persons were arrested, he added. 10 kgs of heroin, 1645 kgs of ganja, 78 kgs of opium, 22 kgs of opium seeds, 6 kgs of brown sugar, 5,900 N10 tablets, 8,86,880 WY tablets were seized. He added that due to the drug and alcohol abuse, the approximate number of widows in the state is about 15,000. In a survey conducted in 2017, there are a total of 36,000 drug abuse victims wherein around 26,000 are abusing drugs by injection and other 10,000 by oral consumption. In his speech Minister for Health and Family Welfare L Jayantakumar Singh said sectors such as health, education, social welfare should co-operate and co-ordinate to create awareness campaigns and rehabilitation of drug abuse victims. State Chief Secretary Dr J Suresh Babu, Principal Secretary to CM Vumlunmang Vualnam, Director JNIMS Dr Th Bhimo Singh, officials and students attended the observation. There are also reports of observing the event at various parts of the state.